More than 2000 years ago slaves used to mine lovely crystals of green stone emeralds in famous mines belonging to Queen Cleopatra in the lifeless terrain of the Nubians. Caravans of camels shifted the emeralds to the shores of the Red Sea from where they found their way into Europe, the middle and far East. Byzantine emperors Persian Shahs, Chinese mandarins and Indian Rajas everyone loved this green emerald. Likewise the Roman emperor Nero liked to watch gladiator fights fought with a large crystal of emerald. The discoverer of America even wrote a new page in the history of the green stone. In the graves and temple of Mexico, Peru and Columbia the Spaniards discovered great number of large dark green emeralds. This fantastic treasure was plundered within a few years. The Colombian emeralds of exceeding beauty ruled the jewellery market until the 19th century. 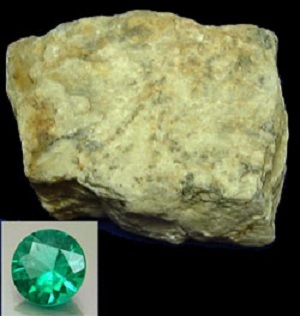 The emerald is one of the many minerals of beryllium. Later, the geologists came to be assisted by dogs in their search for beryllium minerals. Of all the beryllium containing minerals, only beryline is of certain industrial value. It is not surprising that the beautiful beryllium gems have always attracted not only lovers of precious stones but also chemists. The similarity between beryllium and aluminum caused quite a bit of trouble for the author of the periodic law. It was isolated in a free form in 1928 by F. Wholer and A. Bussy, but it was only seven decades later when the French scientist P. Lebeau was able to obtain pure metallic beryllium by electrolysis of fused salts. A study of pure beryllium has demonstrated that it possesses many valuable properties. Being one of the lightest metals, beryllium at the same time is remarkable strong, stronger than structural steels. Moreover it has an appreciably higher melting point than magnesium and aluminum. This fortunate combination of properties makes beryllium one of the basic aircraft metals today. Aircraft parts made of beryllium are one and a half time lighter than those made of aluminum. Excellent thermal conductivity, high heat capacity and heat resistance make it possible to use beryllium and its compounds in space engines during as a heat protective material. Parts made from beryllium are capable of maintaining high precision and stability of dimension and are used in gyroscopic instruments of orientation and stabilization systems installed on rockets space, crafts and artificial earth satellite. Beryllium is very promising in space engineering as, while burning it releases colossal amounts of heat approximately 15000 kcal per kg, Thus, it can be used in highly efficient propellants for flight to the Moon and other cloistral bodies. Alloys of beryllium with copper beryllium bronzes are widely used in aviation for the manufacturing of many elements requiring high strength, good resistance to fatigue and corrosion. Retention to elasticity in a wide temperature range and high electrical and thermal conductivity. In modern heavy aeroplane more than 1000 parts are made of these alloys. Thanks to its elastic properties beryllium bronze serves as an excellent spring material. Springs made from it are particularly effected by fatigue, being capable of with standing up to 20,000,000 load cycle. The addition of even a small quantity of beryllium to steel gives excellent fatigue resistance. This works as a vitamin for steel but unlike steel, beryllium bronze does not spark when hit on stone or metal. That is why it is indispensable for making tools used in explosion, hazardous work in mines, at power factories and oil dumps. Beryllium and lithium alloys will make lightest alloy that will not sink in water. Saturation of the surface of steel parts with beryllium (berylization) substantially increases the hardest strength and wear resistance. Be transmits x-ray better than any other metal stable in the air. The windows for x-ray tubes are made from it through out the world. The sound transmission ability of Be is record breaking 12,500 meters per second as against 330meters per sec in air. The heat insulating property of Be may be used in studying the deep lying layers of our planets. Lately, from a little known, rare element it has become one of the most important metals of 21st century.